I had this offcut of teak or mahogony I found,it was an odd shape so I cut it to an oval shape and used a drill and forstner bit to get the general shape I wanted,i then used and angle grinder to smooth out the dish,it is sanded to 400grit with danish oil applied.How can I tell what wood it is?It was real hard to cut with the jigsaw.Im not quite sure what its for i just let the shape flow as i was working the wood. The wood looks 100% like mahogony in my eyes. Thanks,im only starting out at woodwork im often not sure how to identify what wood is what unless im getting it in a shop! Welll, the more types of wood you handle, the better you will be able to tell them apart. I havent had access to as many woodtypes as I would have liked, but I DO have some nice pieces of mahogony, and the shine, the grain gives off when light hits it, is very distinct. Ahh a wading pool for a little green man!! Good job, how many flap discs did you go through? i just used one and its still good to go!I was surprised how qiuck it ate through the material!i had intended for it to have higher sides but my first time using the grinder on wood put an end to that! They work like a dream. 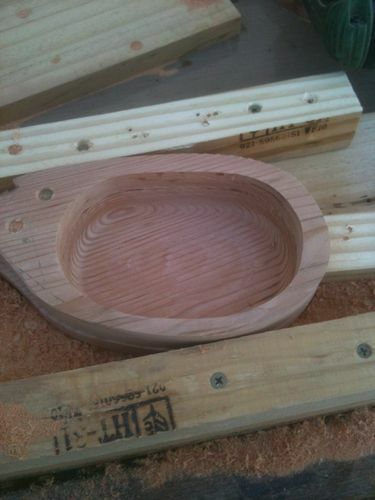 To keep the sides higher you may want to consider a bowl cutter, but that’s for another time. 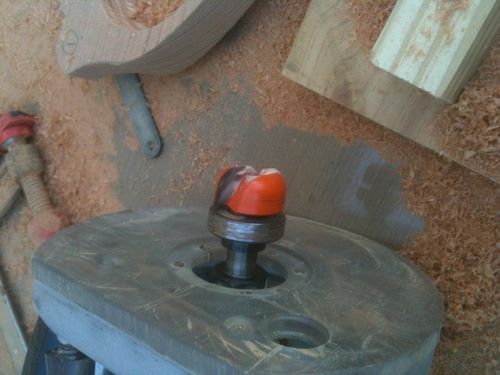 My Grandkids piggy banks in progress…..
Hey Rob is there another name for the bowl cutter you suggest?I googled it but all that comes up are meat grinders! just figured out its a router with a bit on it!the picture mislead me! Check out my blog on “Piggy Banks” there may be some better pictures there.